Pineapples are a delicious tropical fruit that has been celebrated for centuries not only for their distinct and unique taste but also for their seemingly miraculous health benefits. Pineapples are eaten fresh, juiced, cooked, and preserved and their leaves are even used for wallpaper and ceiling insulation. They belong to the Bromeliaceae family and are actually a composite fruit made of coalesced berries that grow at the crown of a fruiting tree. Aside from the interesting story and appearance of this fruit, it is also a storehouse of huge health benefits due to its wealth of nutrients, vitamins, and minerals, including potassium, copper, manganese, calcium, magnesium,vitamin C, beta-carotene, thiamin, B6, and folate, as well as soluble and insoluble fiber, and bromelain. Consuming fruits and vegetables of all kinds has long been associated with a reduced risk of many lifestyle-related health conditions. Many studies have suggested that increasing consumption of plant foods like pineapples decreases the risk of obesity and overall mortality, diabetes, heart disease and promotes a healthy complexion and hair, increased energy, overall lower weight. 1. It’s packed with vitamins and minerals. They’re loaded with vitamin A, vitamin C, calcium, potassium, and phosphorus. While it’s rich in fiber and calories, it’s low in fat and cholesterol. Pineapple contains manganese, a mineral necessary for your body to build strong bones and connective tissues. Bromelain is an extract found in pineapple stems and works to neutralize fluids to make sure they’re not too acidic. Bromelain also regulates the pancreatic secretions that aid digestion. 4. It keeps gums healthy. Pineapple has such a high vitamin C content, eating the fruit lowers your risk of gingivitis and periodontal disease. Periodontal disease not only destroys gum tissue and jaw bones, but has been linked to heart disease, strokes, and diabetes. Including more vitamin C in your diet improves your body’s ability to fight invading bacteria that contribute to these diseases. Pineapple has anti-inflammatory qualities, so including the fruit in your diet can alleviate the pain of arthritis, along with similar conditions, like gout and carpal tunnel syndrome. Pineapples have a high amount of potassium and a low amount of sodium, your body will maintain normal blood pressure levels. 7. It has anti-cancer properties. There might not be a cure for cancer, but there are things that can help you prevent it, and pineapple is one of those things. Because pineapples are so full of antioxidants, they help fight against free radicals. Free radicals are groups of atoms that do major damage when they come in contact with your cell membranes or DNA. Antioxidants prevent free radicals from doing damage in your body by keeping cells healthy. Because antioxidants prevent cell damage, they lower your risk of cancer because your cells are stronger. 8. It prevents coughs and colds. The pineapple is rich in vitamin C, which means it naturally boosts your immune system. This helps you fight off coughs and colds. It contains bromelain, which loosens mucus and suppresses coughs. 9. It lowers risk of macular degeneration. Macular degeneration is caused by damage to the retina and is the primary cause of vision loss in adults. As you age, macular degeneration makes it harder for you to recognize faces, read, see street signals, and similarly hinder other everyday activities. If you add pineapple in your regular diet, you can lower your risk for this disease by up to 36 percent! This is because pineapple is full of beta-carotene, which is good for your sight. 10. It’s a good weight loss food. Pineapple is low in calories, sodium, cholesterol, and saturated fats while being a good source of fiber. This makes it the perfect weight loss food because it’s a healthy, filling, and tasty snack! 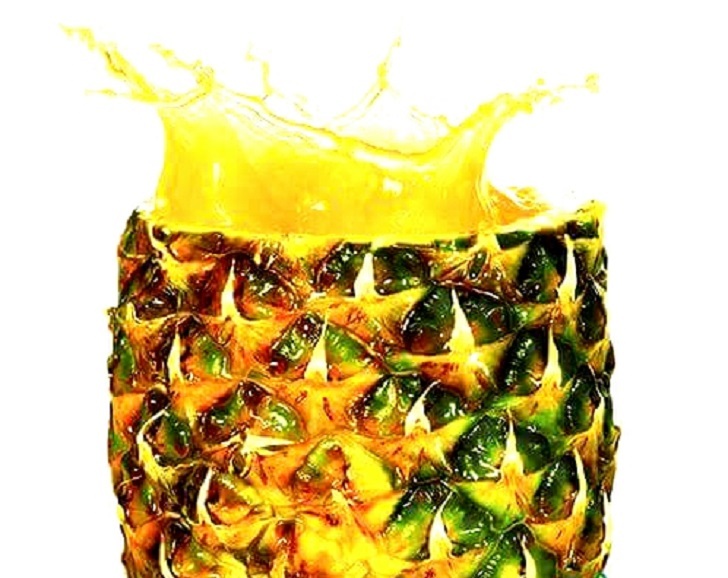 A key benefit from pineapple juice intake is that it averts nausea or morning sickness. This is quite useful for pregnant women who usually experience nausea. It also helps people who are looking to go on airplane trips that usually cause motion sickness.